At Halloween, it is my pleasure welcome this guest post from Roger Clarke, the Paranormalist of Shoreditch and author of A Natural History of Ghosts published tomorrow by Penguin. Last Saturday, 27th October, the Fortean Society held a Ghosts Conference at the Bishopsgate Institute and, in between lectures on ‘Ghosts in London’s Hospitals and Theatres’ and ‘Ghosts of the Senate House,’ I attempted to access some nineteenth century trades directories housed there. My friend and now host, The Gentle Author, no stranger to the building – indeed, known to haunt it – had suggested I research there in my quest to find out more concerning an intriguing Shoreditch figure, Georgiana Eagle. 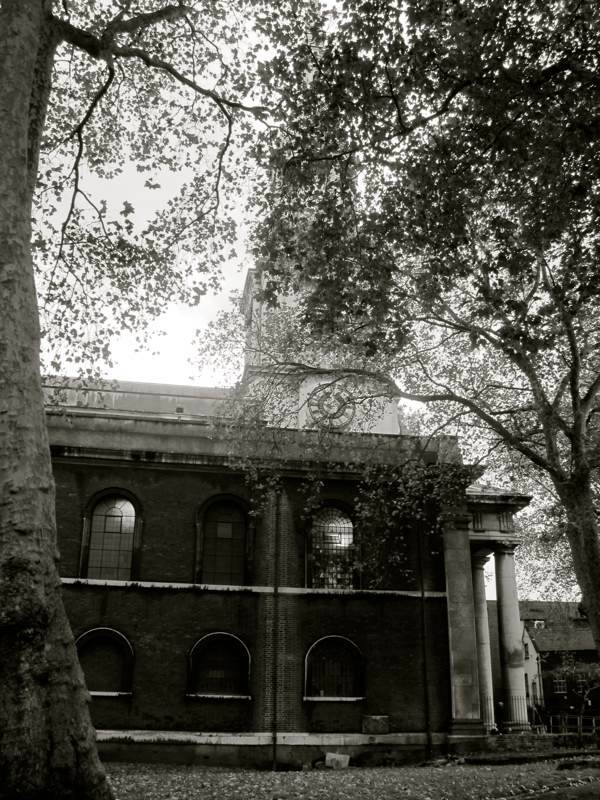 She was christened at St Leonard’s Church and her grandfather was a Shoreditch publican of Huguenot descent. I was trying to find out which pub. Was it one of the ‘lost’ haunted pubs of Shoreditch – Ye Olde Axe or the Nag’s Head on Hackney Rd, for example? I had come across the name of Georgiana Eagle while researching my book A Natural History of Ghosts, and as a Shoreditch resident myself, I was naturally intrigued by her. Dalston was a Victorian nexus of young female psychics including the infamous Florence Cook in the eighteen seventies, and there was a very famous Dalston spiritualist group at the time many of whose members worked on the railways – two recently-built spurs (now the Overground) had opened up the area and were apparently instrumental in making Dalston popular for séances. It was a new area, opening new doors into the other world. However it seems an even younger East London psychic proceeded Miss Cook by several decades amongst the furniture-making factories and leather-working rooms of Shoreditch. 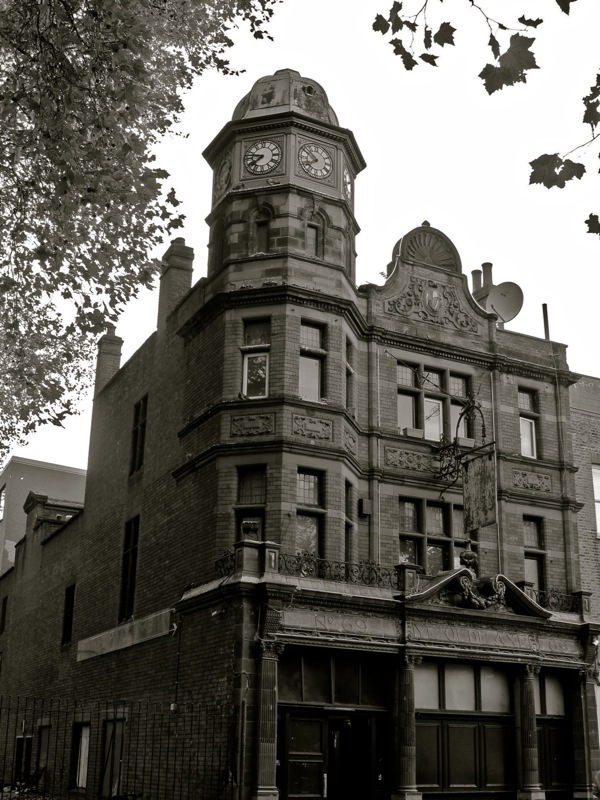 For many years, until 1963 in fact, a gold watch that was displayed in the College of Psychic Studies in Kensington was linked to Georgina Eagle. Known colloquially as ‘Vicky’s Ticker’ it had sported the following inscription ‘Presented by Her Majesty to Miss Georgina Eagle for her Meritorious and Extraordinary Clairvoyance produced at Osborn [sic] House, Isle of Wight, July 15th, 1846.’ It seems it had been bought by the famous newspaperman and even more famous Titanic victim W.T.Stead, and donated to the medium Etta Wriedt precisely because she was known to channel the imperious voice of the late queen. It has been a holy grail amongst biographers of Queen Victoria to find the mediums the grieving queen might have consulted after the death of Prince Albert but, surprisingly, there is absolutely no evidence she ever consulted one. At first glance, this mysterious watch seemed to suggest otherwise though after a little research it soon emerged there were always, frankly, insurmountable problems with its authenticity. The name of Osbourne House was misspelled. The date predates the demise of Albert and also the advent of the London séance fashion by several years. It also turns out that little Georgiana’s father was a quite well-known stage magician called Barney Eagle. In fact, little Georgiana did a double-act with her father, a mind-reading trick still in use today, and travelled round the country to local theatres and fairs. Though Eagle was not a conjuror of the first rank, he seemingly had a great gift for self-promotion and made hay with a public spat with another, much more famous, magician named John Henry Anderson. According to the magic historian Charles Waller ‘Of all of Anderson’s imitators, he was the most impudent…he stole Anderson’s tricks, copied his patter, and exactly produced his programme and billing matter’. Also 1846, the date on the watch when Georgiana was only eleven years old, was also the date he published his ‘Barnado’s Book of Magic’. Young Georgiana was billed by her father as ‘The Mysterious Lady,’ and members of the audience were invited to blindfold her in an ‘unmasking of clairvoyance’ (according to the Yorskhireman in December of that year). Was the watch, which was stolen in 1963 and has never been since, simply a bit of promotional kit used by Barney Eagle to get attention for his book and his mind-reading act in 1846? Or did he add an inscription later? More likely, either Stead or Wriedt added the inscription after hearing a garbled version of the story – and that her act, for from professing to be of clairvoyance, was in fact a bit of flagged up vaudevillian fun. As early as 1843, Eagle describes himself as an ‘ambidextrous prestidigitator to Her Majesty the Queen’ and adopted such colourful stage names as ‘The Napoleon of Wizards’ and ‘The Royal Wizard of the South.’ His insistence on some kind of royal connection over many years does suggest that at some point a member of the royal family witnessed one of his shows and that this was his main calling card. He died onstage in a Guernsey Temperance Hall in 1858, leaving his store of stage props and tricks to Georgiana, who only fitfully used them over the following years as her three husbands came and went – a photographer, a music professor and a finally a draper twenty-five years her junior. 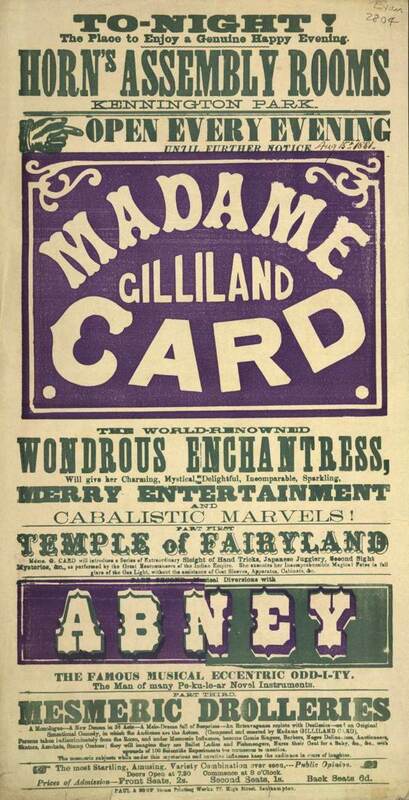 In 1873 in Cheltenham, she was billed as the ‘World Famed Wizard Queen, Humourist and Clairvoyant Mesmerist.’ Vicky’s Ticker seems certain to have been amongst her effects when she died in 1911, since that is the year it ends up with the mediums of Kensington. It isn’t clear from these later bills whether this Shoreditch girl was now passing herself off as a real medium, and stranger things have been known in the annals of mediumistic practice. Her professional mention of humour seems however to suggest a quality usually lacking in the world of the Victorian Spiritualist, a little levity, and it must be seen as an irony she should end up role-reversed after death, co-opted and contained by the professional organisation of the very people she was actually debunking. As it happens, the library section which listed publicans of the era was closed for lunch and I never had time to go back, after getting sucked in to a talk on the Enfield Poltergeist. I like to think of her in one of the more freighted pubs of the area, perhaps at Ye Olde Axe which, though opposite the church where she was christened, is now a strip joint with an unfairly beautiful exterior. I see it every day from my house, where I wrote my ghost book, with its forlorn, stopped clock. According to Guy Lyon Playfair – the main investigator of the Enfield Poltergeist - in his Haunted Pub Guide - ‘In 1979, a team of workmen spent nine weeks renovating Ye Olde Axe, which had been derelict for twenty-five years and had enjoyed a fairly unsavoury reputation before that’. Whilst the workmen were digging out foundations for a new fire escape, they found the skeletal remains of two people, including their legs and skulls. The bodies were buried in a trench two foot deep, along with a pair of rusty scissors. The workmen had stayed overnight onsite in the somewhat derelict building. Playfair tells the story of one of these, one David Simcoe. ‘I’m a light sleeper,’ he said, ‘and one evening we heard quite a lot of noise and thought one of our mates had come into the room where we were sleeping.’ The next morning, they learned that he had been sound asleep before they had gone to bed. The following night, the men put a plank against their bedroom door. In the morning the plank was down and the door was open. This, said Simcoe, was just one of several strange things that had happened while he had been there. I have a feeling that we can expect more of this kind of thing, in view of this pub’s history. St Leonard’s Church where Georgina Eagle, World-Famed Wizard Queen, Humourist and Clairvoyant Mesmerist, was baptised. Ye Olde Axe where the mysterious skeletal remains were discovered, buried with a pair of rusty scissors. 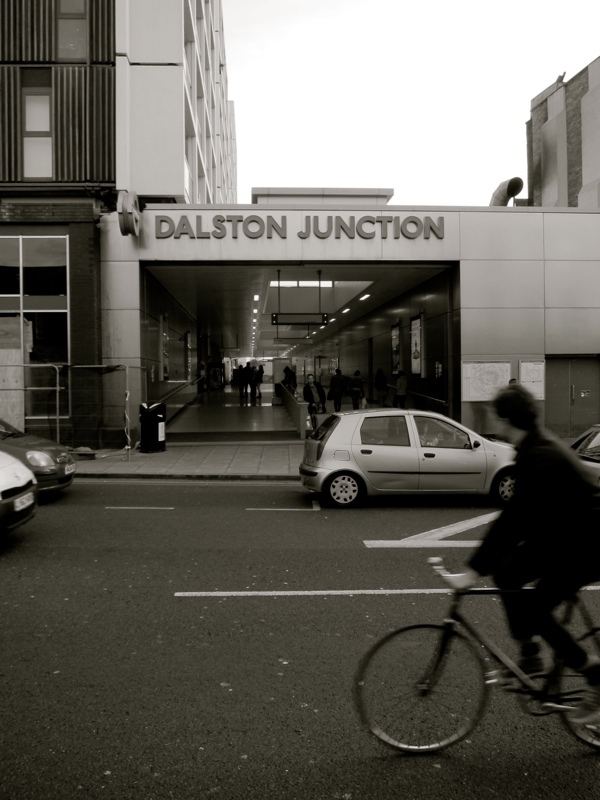 Dalston became a nexus for female psychics in the eighteen seventies due to improved transport links. Georgina Eagle commonly performed under the stage name of Madame Gilliland Card. All very good for a story, but …..
Hello! A brilliant post and we hope Roger enjoyed the conference. We’d be very happy to have Roger give a talk on mediums of east London or another topic at one of our regular London Fortean Society meetings at the Bell. Pleae get in touch!